So much fun to be hopping with designers from My Sweet Petunia today! You're in for a treat with this talented crew. If you just happened onto the hop because you're a regular reader here, be sure to check out the link list at the bottom of this post so you don't miss anything! If you're hopping already and you came from Kia Clapper's blog, you're doing just fine. As a stamper, the MISTI has been a huge game changer for me, but as a stamp designer, it's been really amazing as well. I really enjoy creating realistic layered stamp sets like the Sunflower Set I used here, and I can count on perfect placement for each layer with the MISTI. (To see how I position the layers using a clear acetate sheet, click HERE.) So I'm grateful for this tool, that enables me and you to use these stamps with such amazing results. I'll link the other layering sets below (with a coupon code!). I love using geometric die cuts, and rotating them for a repeating stamped design like this. This time I was having trouble getting the layers positioned just right with the card in the corner, so I created my own corner with sticky notes. I have much better results using the clear sheet rather than just lining up the stamps visually - if you're able to eyeball it, the traditional corner placement will be fine. I used a variety of dye inks for layering - it's so helpful to have an index of my inks when choosing colors. Please be sure to visit these talented designers to see what they've created, and what they're thankful for! Every comment that you leave along the way is another chance to win - one MISTI for you, and one for a friend! The winner will be announced Monday, so you've got the weekend to visit and comment. Thank you for visiting me today! Happy Thanksgiving! Dina I love the Sunflowers. Thanks for sharing the acetate trick. Gorgeous card...such vibrant colors. And I agree, the MISTI is a definite "game-changer". I've saved a lot of cards. Love this gorgeous Sunflowers, the colors are just like the ones that grow in my backyard for the birds. So glad you mentioned the acetate sheet, I use one all the time for perfect positioning of cling red rubber stamps, specially sentiment stamps, to make sure they are perfectly straight. Thank you for sharing how you made this gorgeous card. You have done it again. Beautiful sunflower and the layout is perfect. Thanks. I do not own a MISTI am I know by looking at your beautiful sunflowers what I am missing out on. You've achieved gorgeous dimension to the flowers. What an incredible invention that MISTI is for the card making world. Dina, I love these sunflowers! So realistic and vibrant. The layered stamps are a great addition. Thx for sharing and HAPPY THANKSGIVING! Oh my that sunflower image is gorgeous and so is your card!! Thanks for the tips!! the MISTI has also changed my stamping life! So happy and beautiful Dina ... love! I haven't tried layering stamps - but I can certainly see how the MISTI would help line things up. It's getting harder and harder to stamp as my hands stiffen more with arthritis, so it sure would be nice to have a little "helper!" I really love this card and your stamps. I have a weakness for sunflowers...Beautiful! Your artist side is showing beautifully... with the help of your MISTI ;). I am thankful I found this hobby 20+ years ago! This card is stunning!! Love it! I love sunflowers and this is bright and beautiful, Dina. Thanks for sharing! What a glorious card! I haven't tried layered stamping yet but that is on my to do list. I am thankful for the MISTI because it not only helped me be a better stamper but it enabled my Art class students to stamp their own sentiments for their Mother's Day cards that we make in class. I am hoping to acquire more of them so my students won't have to wait so long in line to use it. I love this card!!! I'm thankful for all the inspiration I'm getting from this blog hop. I have a stamp similar to this, I love it! What pretty sunflowers. Thanks for sharing your love for the Misti also. Beautiful card. You really show us how the MISTI is such a helpful tool. I am thankful for all of the fabulous people in my life. Peony stamps and a coupon code? Don't mind if I do! ;) Love this card, girl!! Oh my! This is stunning! LOVE the brilliant colors! Sunflowers and Poinsettias are my 2 favorite flowers and you have colored these beautifully! I am in love! The MISTI is a godsend to me! After an injury and a few hand/wrist surgeries to replace and repair tendons and nerves I was unable to stamp clearly! With the MISTI I CAN!!! YAY! TFS! So pretty! Would make a nice gift! Happy Thanksgiving! Sunflowers are my favorite flowers and seeing your card and design reminds me why I like the flowers so much. Your beautiful card shows why the Misti is a great tool for crafters. I'm thankful you take the time to show us that beautiful cards can be created with the Misti. Thank you. Love the yellow, happy sunflowers. This card is gorgeous. I love my Misti, it makes my life so much easier and professional. You see I'm a crooked person. LOL! Everything I do if most likely going to end with something crooked. Misti has saved me! WOOHOO! I have my stamping buddy all chosen to share with if I win. Thanks so much for this opportunity to enter and again thanks for the yellow flowers. They made my day! Beautiful card! Love the sunflowers! Thank you for sharing and Happy Thanksgiving!!! Gorgeous card and I like your acetate trick. Thanks for all your inspiration! You had me at sunflower! Stunning card...it is so cheerful! Love how the DT is describing the MISTI...how can I live without one?!! Stunning how this just pops.Exquisite indeed. Beautiful card. Sunflowers are such happy flowers and always put a smile on my face. Thank you for being a part of this giveaway. Gorgeous card the sunflowers really stand out. I couldn't stamp without my misti. Misti is at the top of my wish list,hoping to find one on Black Friday! You are very inspiring,great ideas! Love the beautiful flowers! Your card is awesome! I love sunflowers! They always make me smile. Beautiful! You're layered stamps are AMAZING Dina! I LOVE that they are LIFE LIKE! I LOOOOVE seeing the different techniques you can use with this AMAZING TOOL, the Misti, too! THANK YOU DINA! ;)HAPPY THANKSGIVING! What a happy card. Thank you so much for sharing and inspiring!! Happy Thanksgiving! Dina, I love your technique with the acetate and layering; your sunflower is so realistic. Thank you! Beautiful sunflowers. The sentiment fits perfectly. Love your card! All that sunflower goodness! Sunflowers are the perfect flowers for Thanksgiving, in my estimation. Your card is simply gorgeous. Beautiful card. I can see how the MISTI makes it so much easier to line up all the layers. TFS. Your sunflowers are absolutely gorgeous!!! The MISTI would make layering a breeze! I've got to order the sunflowers!!! Thanks for sharing and being in the giveaway. I'm finding new blogs to follow. Your card is gorgeous! Your layers for the flowers are so pretty. Your layered sunflowers are just gorgeous! Thank you for the tips on using the Misti, which I still don't have. Anything that improves the quality of my stamping is a must-have for me. Fabulous colors and balance...pepped up by the perky bow and tag. Love it. Love the flowers! One of my faves!! The MISTI is a must for using layered stamps. Makes the process so easy! Thanks for the great tip on using acetate. I love the sunflowers. Love the colors and always sunflowers make me smile. Great card! Gorgeous card! Love those beautiful colors and the depth that the layering allows! Awesome tip with the acetate sheet! Fantastic card. Love those sunflowers. Thank you for sharing you techniques. Happy summer flowers. Thanks for sharing! Beautiful card! And your Stamp sets are to die for. Happy Thanksgiving! I absolutely love the beautiful sunflower! It is one of my favorite flowers!! What a stunning card! I love it. Layered stamping is something I've never done but winning a Misti would certainly give me cause to give it a try. Thanks for sharing such a wonderful card and for the opportunity to win such a great prize. Your sunflowers look so realistic. You designed a beautiful set. Thanks for sharing and have a Happy Thanksgiving. Love your sunflower card. Cannot wait to look at your other designs. I love sunflowers which is crazy because I don't like yellow. You did an excellent job on this card. The sunflowers are beautiful on your card! The depth of color on those flowers is so realistic. Wonderfully done! The greatest tool ever and would love to have one of my very own. WOW! Gorgeous! Love those flowers and thankdul you shared your technique with us! Beautiful card. The acetate tip is priceless, thank you! Gorgeous sunflowers they look so real. Beautiful job. Wow! These sunflowers look like real flowers are laying there! Love this beautiful card! Thanks so much for the great tips & Happy Thanksgiving to you & yours! Love your card and your layering stamps! Gorgeous! Just stunning, thank you for sharing. With a Misti I can see that I can rekindle the friendship I have with my layered stamps, I love the technique but was never ver good so gave up...with Misti there is hope again for this I am grateful. The sunflowers remind me of the ones that came up wild in my yard. Beautiful work. Beautiful card! Would be wonderful to win a Misti! What a stunning card! Those sunflowers are absolutely gorgeous! I am totally amazed with the techniques you used to create the most beautiful sunflowers! The MISTI is definitely on my wish list and I would love to gift one to a crafty sister! Have a very Happy Thanksgiving! this card made the day better. Amazing card and colours, I would not be without my Misti now, ever! Luv how you designed this card. Beautiful card design. Thanks for a chance to win a MISTI! Just beautiful! I love sunflowers. AWESOME Card, Your layered stamping is so realistic! I am thankful for my sweet crafting/water exercise friend Michelle! What a beautiful card. Thanks for sharing it with us. Those stamped flowers are AMAZING! I love the colors and the artistry! Lovely, awesome sunflower card...the layered blooms are perfect. Your sunflower card is amazing! I can't believe the detail - it looks like you just picked it! That sunflower set is amazing. I love that. So beautiful. This is just beautiful!! Love the realistic effect! The Misti makes layered stamping so much easier! Beautiful sunny uplifting card. I bet using a MISTI to create this is a must. Thanks for the chance to win! Happy Thanksgiving! The colors of your pretty card is amazing. Wow just super amazing!! I have sunflowers all over my kitchen- yours look so real . Thanks for sharing! Gorgeous sunflowers! Layered stamps are challenging for me, but so much easier with my MISTI! Your layered sunflowers are GORGEOUS... what a fab creation - as is the MISTI!! I'm tickled to have the chance to gift a MISTI to my crafting bestie, Mary, who encourages me so much in my crafting endeavors! Great idea to use an acetate sheet to align irregular shapes! Love my MISTI! I want to gift my sisters with one! Wow! Lovely card and thanks for the tips. This is a show stopper. Love the stamp you used. Thanks for sharing. Happy Thanksgiving Dina. Such a pretty card. Love the realistic looking flowers... the layers are amazing! I love the MISTI. I have a regular size, but often could use the mini. I am so thankful for my mother-in-law. She holds the family together! LOVE your GORGEOUS sunflowers, the layered stamping gives DELIGHTFUL colours and dimension, LOVE IT ALL!!! Gorgeous card Dina - that is so neat that you also create stamps! 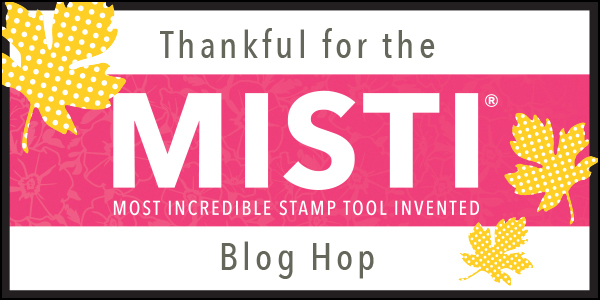 I love that you have a verse on your blog too -- that was encouraging in itself :) I'm so very thankful for crafters who selflessly share their talent and I'm grateful for my new stamping friend Renee who would love a MISTI (almost) as much as me. Such a pretty card! Thank you for the inspiratioN! Beautiful card... those sunflowers are amazing looking. Thanks for sharing! Gorgeous card, I am having some major inspiration to go stamp after following this blog!! I've never seen this sort of stamping done with a Misti, but it makes total sense. I'd like to try it. My friend Carole Ebel would like to win, too. I love sunflowers and layering stamps and the MISTI makes them so easy especially when doing multiple cards. Your card is beautiful. Dina, this card is amazing!!! I love it. Multi step stamping isn't as scary as it used to be, thanks to the MISTI!!! Awesome giveaway opportunity! Can't wait to own a Misti!!! Oh sunflower card is so beautiful. Would love to win a MISTI. I have had on my list forever and would love to share a win with my friend. The sunflowers are so realistic and beautiful. I love sunflowers! Thanks for sharing your talent. I discovered your blog through this hop and will be back often. Thanks! Dina I simple love how the flowers surround this card. Truly a card filled with sunshine. I went back to look at your acetate technique with the Misti, and I know it's one I'll try as it looks like it really takes the guess work out of the positioning. So many great projects on your blog.......Ii'm coming back! Hope you had a Happy Thanksgiving and happy stamping! Beautiful card - I love sunflowers. I don't own a Misti, but sure would like too. I struggle with stamping sentiments straight so think this would help. It would be so fun to share this with my other stamping friends. Wowsers! Those are some fabulous sunflowers! Oh I do love your sunflowers. I love the techniques you shared. This tool is on my Christmas List and how awesome the opportunity to win one for me and my friend Gail! Thank you! Your layered sunflowers are absolutely beautiful. I love sunflowers - very nice card. Oh, Dina, this is absolutely beautiful!!! Thank you for sharing! I am so thankful for the MISTI and for all of you that are participating in this blog. It is so wonderful to learn new techniques. If I were to win, I would give the additional MISTI to my one and only sister-in-law. Thank you, Dina! Your sunflowers are AMAZING! Great tip about the acetate. I'm thankful for all the inspiration the MISTI hop is giving me. The gift MISTI would go to my dear friend, Teri. Oh wow Dina, your card is stunning, love those gorgeous sunflowers! Thanks for sharing your beautiful card with all that color! I still have never used a Misti, but love that it makes crafting easier and more fun.